﻿ How to Import Mini DVD into iMovie, Transfer Mini DVD to Mac? Compared with tape-based (Mini DV/HDV) camcorders, Mini DVD camcorders have gain more popularity in its convenience. 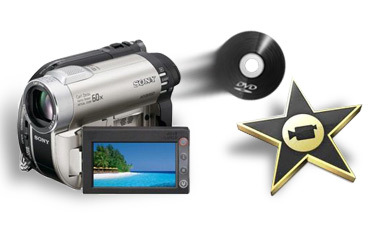 Footage from Mini DVD camcorders can be dropped into and played on a DVD player. However, when try to import Mini DVD into iMovie; you will fall into headache situations. One who owns Mini DVD camcorder like Sony DCR-DVD92, Sony Handycam, Canon DC20, Panasonic VDR, had better read this article. The headache situations you will come across when try to import Mini DVD into iMovie. Situation 1: For iMovie runs on Mac. So if you want to import Mini DVD into iMovie, the first thing you need to do is to load Mini DVD to Mac. A Mini DVD can be played back in most DVD players that are tray loaded. Most slot loading players cannot use this format expect the PlayStation 3 and the Wii. However, DVD players on Mac are slot loading. So problems come out when you load Mini DVD through slot loading players. Situation 2: Since Mac slot loading DVD players cannot load Mini DVD, you had better try to connect the Mini DVD camcorder to Mac using FireWire, or USB if it has one. This time your Mac does recognize the footage, but iMovie will not. Though iMovie 08/09 is said to work with MPEG-2 which is used to record DVDs and Mini DVDs, as many people indicated that iMovie 08/09 is just said than done. So when try to import Mini DVD into iMovie, you will fail in the end in most situation. Situation 3: Neither Mac slot loading DVD players can load Mini DVD, nor Mini DVD camcorder has a FireWire or USB output to connect with Mac. Shop for separate external drive or full-size adapter also can helps to insert Mini DVD to Mac. But iMovie still refuse to import Mini DVD. No more worried about it! Any situation becomes so easy to solve so long as your own Bigasoft VOB to iMovie Converter for Mac. After successfully loading a Mini DVD into Mac in whatever situation above, we encountered another headache situation that is iMovie refuses to import Mini DVD. So what could we do this time? It is just a piece of cake so long as you own Bigasoft VOB to iMovie Converter for Mac. 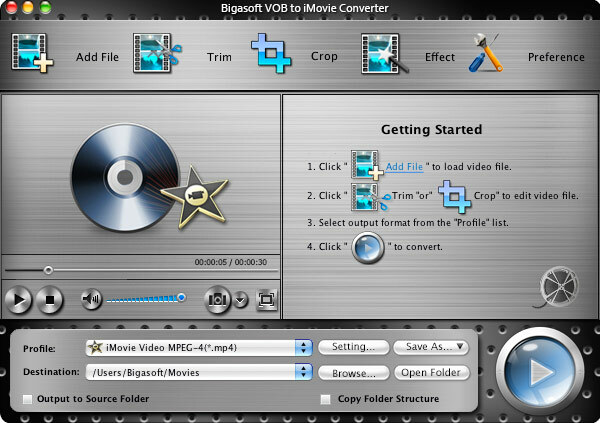 Bigasoft VOB to iMovie Converter for Mac assists you to convert DVD discs/Mini DVD to iMovie compatible format. It can convert Mini DVD to iMovie MPEG-4 video (.mp4), iMovie HD Video MPEG-4 (.mp4), QuickTime MOV, MP3, AAC, M4A and WAV with high speed and great quality. The following is a step by step guide on how to import Mini DVD into iMovie with the help of Bigasoft VOB to iMovie Converter for Mac. 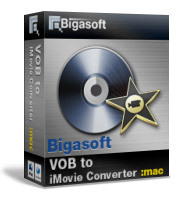 Firstly, Free download Bigasoft VOB to iMovie Converter for Mac, install and run it. Then, the following main interface will pop up. At first, load Mini DVD to Mac. Then look at the main DVD to iMovie converter interface, click "Open DVD" button to choose "Open DVD" or "Open DVD Folder" to load Mini DVD file. 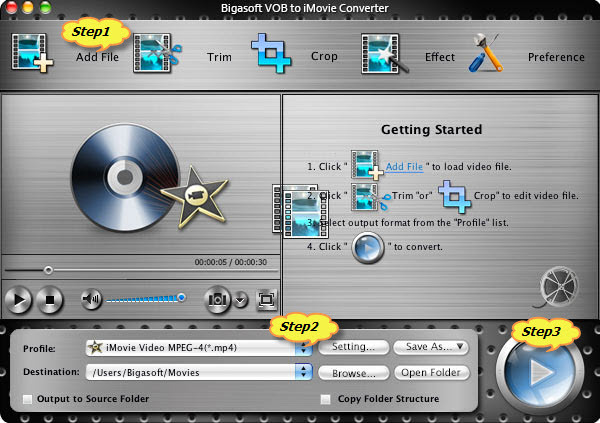 Or simply drag and drop Mini DVD file to Bigasoft VOB to iMovie Converter for Mac. Click the down list button on the right side of the "Profile" button to set the output format as iMovie Video MPEG-4(*.mp4). Click the "Start" button to finish converting Mini DVD to iMovie supported MP4 format. 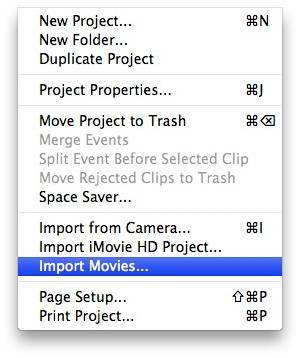 Run iMovie, and then click "File -> Import Movies..." to upload the converted Mini DVD to iMovie. Mini DVD (MiniDVD or miniDVD) is a DVD disc having 8 cm in diameter. It is on a CD-R(W) instead of a DVD disc. A MiniDVD can be played back in most DVD players that are tray loaded. Most slot loading players like Mac DVD drive cannot play Mini DVD except the PlayStation 3 and the Wii. Directly putting mini-DVD into the DVD drive on Mac without a full-size adapter will make Mac get stuck or even completely ruin DVD drive. Mini DVD has become one of the most frequently used mediums particularly with camcorder recordings for its outstanding advantages, including random access (you can make a play-list in edit/play mode in your camcorder), immediate playwrite/rewrite (you can immediately view your recordings with your camcorder), elimination of blank search, short of finalization time, production, one-stop production solution etc. And MPEG-2 is the format used to record Mini DVD. Though Mini DVD cannot be played back in Mac slot loading player, we have other ways to load Mini DVD to Mac. Method 1 If Mini DVD camcorder has FireWire or USB; just connect the Mini DVD camcorder to Mac using FireWire, or USB to load Mini DVD to Mac. Method 2 If Mini DVD camcorder has not FireWire or USB; just shop for external mini-DVD drive that uses either a USB or Firewire connector cable, and then connect the external mini-DVD drive to your Mac and install any extra software that came with it. Insert the mini-DVD into the external drive, and then access the files on the mini-DVD as you normally would to load Mini DVD to Mac. Method 4 If Mini DVD camcorder has not FireWire or USB and you don't want to buy a separate external drive or full-size adapter either, but you do have access to a PC, you can transfer the files on the mini-DVD onto the PC, then put them onto a USB flash drive, which will work on your Mac. With this ideal DVD to iMovie Converter, just enjoy editing Mini DVD with iMovie '08/'09/'11!